KNOXVILLE — Potbelly Sandwich Shop is opening its second Knoxville location on December 8, 2016. The shop is located in downtown Knoxville across from Krutch Park at 522 South Gay Street. Widely acclaimed for being a popular neighborhood hangout, Potbelly features toasty warm sandwiches, hand-dipped milkshakes and live music. Potbelly shops have earned a reputation in communities coast-to-coast for having delicious food, fun décor and fresh tunes. Mark Ray, the managing owner of the new sandwich shop, lives just north of Knoxville and has close community connections along with an extensive background in the foodservice industry. Ray will run the new downtown Potbelly Sandwich Shop with assistant manager Jeffrey Dicen. Ray will mainly manage the restaurant’s operations, focusing on hiring and training new staff, and working to develop the unique Potbelly culture. Ray is in the process of hiring about 30 employees for the downtown location, including customer service staff and managers. The shop will be open Monday through Wednesday from 10:30 a.m. to 8 p.m., Thursday, Friday and Saturday until 9 p.m and Sundays from 11 a.m. to 5 p.m. Ray is looking to begin delivery services six to eight weeks after opening. 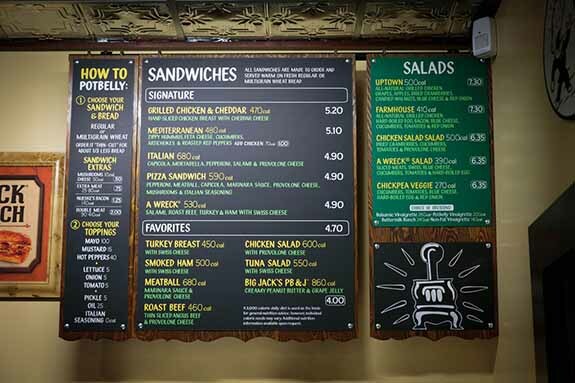 Potbelly Sandwich Shop first opened in Chicago in 1977, and now includes more than 400 shops across the United States. There are also 30-plus franchise shops in the United States and abroad. Potbelly Corporation owns and operates over 400 shops in the United States and its franchisees operate over 30 shops domestically, in the Middle East and in the United Kingdom. For more information, please visit www.potbelly.com.